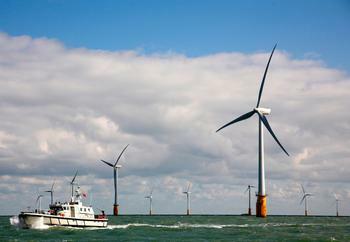 LONDON, UK, September 23, 2010 (ENS) – The world’s largest offshore wind farm officially opened today in the English Channel 12 kilometers (7.4 miles) from Foreness Point, off England’s southeast coast. Owned and operated by the Swedish energy giant Vattenfall, the Thanet Offshore Wind Farm has 100 turbines and covers an area of 35 square kilometers (13.5 square miles). With 300 megawatts of generating capacity, the wind farm will generate electricity equivalent to the annual consumption of more than 200,000 British households. The opening ceremony took place at sea with Vattenfall CEO and President Oystein Loseth and British Secretary of State for Energy and Climate Change, Chris Huhne MP, among the participants. “With Thanet Offshore Wind Farm, Vattenfall has taken a major step towards doubling its generation from wind power until 2011 and we continue to lead the way in offshore wind development,” said Loseth. Vattenfall is one of the biggest wind power operators in Britain and the fifth largest energy producer in Europe. To meet its 2011 target, the company will be constructing nine wind farms in six countries to supply electricity equivalent to the demand of 800,000 households annually. Secretary Huhne said that the wind farm’s 300 megawatts of generating capacity will take UK’s total installed wind power capacity past 5,000 MW, or five gigawatts and boosted UK offshore wind capacity by more than 30 percent. The construction of the Thanet Offshore Wind Farm has taken just over two years and the wind farm is expected to operate for at least 25 years. Each of the Vestas V90 turbines stands 115 meters (377 feet) tall at its highest point. With the Thanet facility now operational, Britain generates more offshore wind power than the total generated in all the rest of the world. The UK currently has nearly 18 GW of wind capacity either consented, in construction or in the planning system, according to RenewableUK. When this is added to today’s five GW of built capacity, it represents more than a third of the country’s current annual energy consumption. “I know that there is still more to do to bring forward the large sums of investment we want to see in low-carbon energy in the UK, and we as government are committed to playing our part,” said Huhne. The five gigawatt threshold was reached as another wind farm came online today – the expansion of Fred.Olsen Renewables’ Crystal Rig wind farm in the Scottish borders with a total generating capacity of 200 megawatts. Crystal Rig wind farm is located on the Lammermuir Hills 40 km east of Edinburgh and 10 km south of Dunbar in the Scottish Borders, adjacent to the boundary with East Lothian. 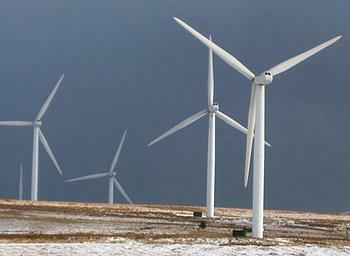 The area around the wind farm is sparsely populated and the turbines are hidden among the hills. Crystal Rig began operating in October 2003 and the 60 turbine expansion to the west of the original wind farm was commissioned today.